Take a l o n g d e e e e p breath. .. drop those shoulders…. E x h a l e …. Connect with yourself right now in this moment. Listen… What are you feeling? …. Where are you feeling it in your body? … What are the stories that are going on in your mind….Notice them… Breathe. 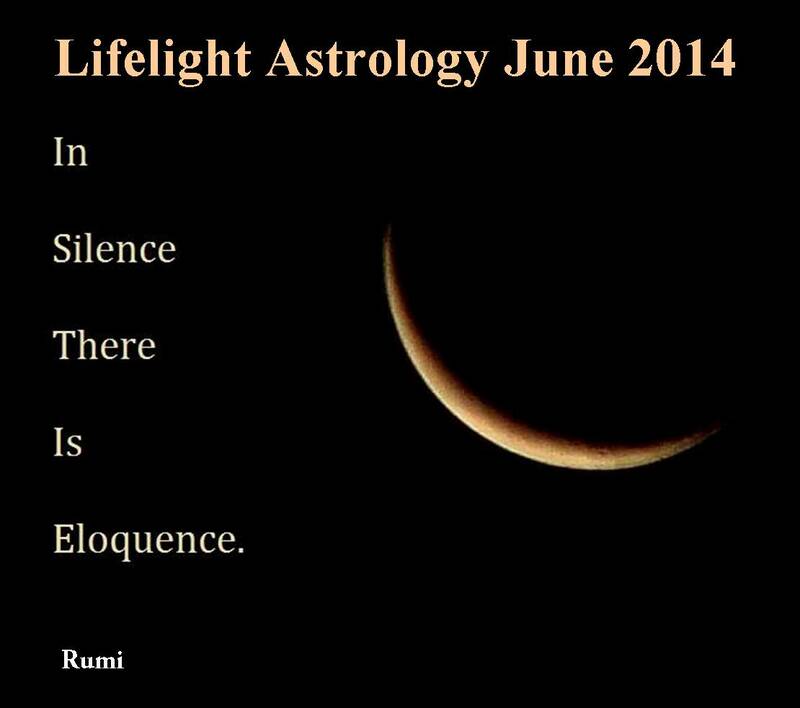 ..
That …right there is the theme for June as I see it. With the Sun currently in Gemini, the focus is on communication and this is usually a social, light, intellectual, airy, chatty, busy time of the year, but this one’s a little different to most. The New Moon in Gemini on the 28th May set the scene for a much more gentle, intuitive, creative, sensitive and quieter June than usual. There’s basically a lot more water around, with a square to Neptune, Mercury (the mind) moving into heart based Cancer and a beautiful grand water trine between Saturn, Jupiter and Chiron. All in all, this is potentially a deeply intuitive, creative, profoundly healing time, IF we take time out to stop and listen. With Mercury turning retrograde on the 8th June in Cancer, we need to remember that if we operate from the level of the rational mind alone, we’re in for possible confusion, delusion and misunderstandings. Stop, be quiet, ask for guidance and bring to mind each alternative one by one. Then tune in with which one feels expansive and which one feels limiting… in your body. The one that makes you feel expansive is very likely to be the right decision. The more we’re able to go into silence, even for a few minutes at a time and listen to our inner compass, which resides in our hearts, the more we tune in with our truth. It really is that simple. Gemini is all about communication and learning, how we speak and how we listen. And the focus this month is on inward communication rather than outer. Really in my experience it’s about taking precious moments to check in with yourself. Let the thoughts just drift in and out of your awareness, taking note of their quality and the feelings they evoke in you. Become aware of the manner in which you speak to yourself, perhaps even judge and criticise yourself and ask whether you would speak to anyone else like that. Simply listening, without judgement… just interested curiosity. Listen too to the words you use when you’re speaking to someone else and how often you repeat the same mantra’s. “ I’ve got no money, I’m scared, I’m insecure, this is not working, I’m irritated, I’ve had enough, I’m sick and tired” These thoughts and words are literally creating our reality and only when we take time to notice them can we choose different ones. One of the greatest gifts I think we can give ourselves and others is that of listening It’s the most incredible thing actually. Try this. When someone you know is worried or stuck or fearful or confused, just listen intently to what they are saying for 5 minutes or so without interrupting.. In my experience, the answers start to drift into up into the speaker’s consciousness, completely… without your help. The same applies if we listen to ourselves. What are the stories you tell yourself about your life and your future and are they true? Will you always be stuck in the place you’re in now? Will you always be overweight, sad, unwell, alone, broke? How do you know that any of that is true? What if you allowed yourself to imagine a life that was everything you dreamed of… and then visualised it often? In every moment that we connect with what we love and feel good, we are re-wiring our brains, lifting our vibrations and changing what we attract into our lives. To help us along with this, Venus, the planet of love, beauty and value, has also just moved into her own sign of Taurus. Yay! Her home visit will help us to get in touch with the false beliefs that run our lives from behind the scenes and assist us in realigning us with the truth of who we are. This will happen mainly when we’re in a relaxed state and fully engaged in things we love to do. Ideas and answers always appear when we’re not pushing and shoving. They flow in when we stop the incessant barrage of information and busyness. Just yesterday I found myself labouring over some creative writing and strategising I was doing to the point that I was going around in square circles. For once, I listened to my own advice and went for a walk. No sooner had I walked out of my driveway than the ideas started flowing in, effortlessly… it was like a tap had been opened. When I got home, I sat down at the computer and the words and ideas just poured out. Eureka! But what about when we have nagging thoughts and worries that just won’t go away? I read a really interesting article the other day on the “ironic monitoring process”, where research studies have shown that our brains actually search for whatever thought or emotion we are trying to suppress. In a series of experiments, a group of participants were told not to think of a white bear while they performed other tasks. A second group was instructed to think of white bears and then not to think of them. Interestingly, the first group, which tried to keep the white bear at bay, thought about them more than once a minute! The second group thought about them more when they were trying to suppress white-bear thoughts than when they were told to think about them. Basically when we try to suppress an intrusive uncomfortable thought or feeling it’s as good as putting out a welcome sign for it. The article suggested and I find that it helps to rather invite the worrying or disturbing thought in, making it intentional. Say it out loud, write it down or talk to someone about it. Then, if you think there is something you can practically do about it, set 5 to 15 minutes where you commit to focussing on it (or really worrying about it if you like). I find that when I notice the thought or feeling rather than suppress it, it relaxes its hold on me and often disappears completely or a solution arises easily and effortlessly when I’m least expecting it. If you are stuck in any area of your life, this is a potent time astrologically to get to the bottom of what patterns or behaviours might be holding you back. If you would like to investigate working with me to help you to Navigate your life, you can read more about the life coaching here. The first step on our adventure together is usually a comprehensive astrology reading, which is often followed by an agreed number of personal navigational coaching sessions, to put you back on course. These include Process Art, Neurolinguistic programming, Energy work and more. So… all you beauties, this month, give yourself permission to slow down, appreciate and cultivate beauty, stop whenever you have a good moment and anchor the sensations into your being. Let yourself imagine the most beautiful future possible for yourself and take yourself to that place as often as you can. Above all, connect to your heart and listen to what it has to say. Subscribe to my newsletter for regular astrology updates and life navigation. 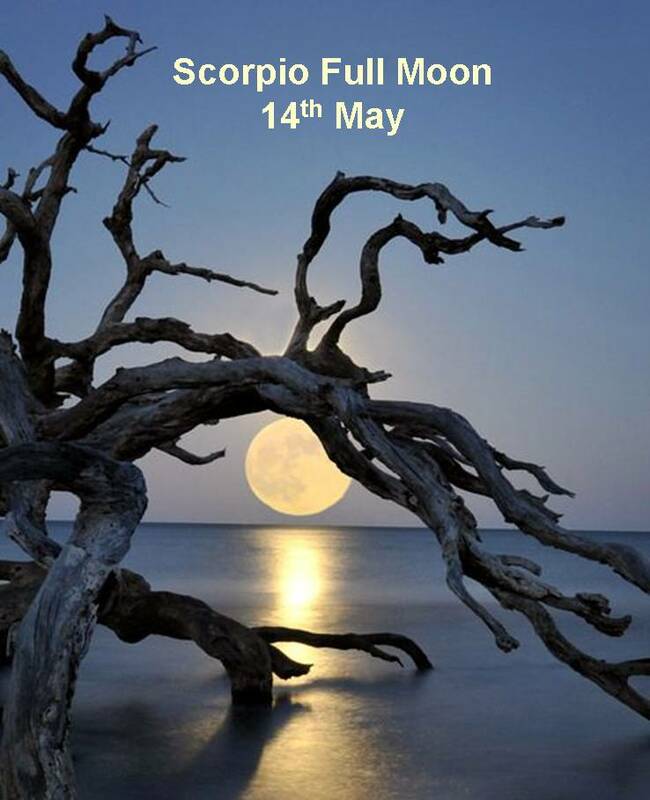 Tomorrow the 14th May we have a full moon in Scorpio – which means that she’s opposite the sun in Taurus – Taurus is all about hanging onto security and the status quo and Scorpio is about transforming and changing – bit of a tug of war, what! In addition to this, we still have a loose grand cross, the moon is in very close proximity to stodgy, serious, Saturn… and Mars, the planet which rules forward motion is approaching a complete stand-still before he finally turns direct on the 19th . Eish! So… To put it simply, this really isn’t a full moon where we’re likely to feel like we’re forging ahead and taking the world by storm. In fact, many of us feel as if trying to move anything forward right now is a bit like pushing a giant boulder up a very steep and slippery hill. So what’s is all about? I wish I had the answers, but the theme for me I think is “To resist or not to resist – that is the question”. As the theme of transformation continues, unabated, our limitations, deepest fears and old conditioned thought patterns are up for investigation…yes again or still, depending on where you are. We’re being urged to invite them in, to feel them, to stop resisting them and in so doing, to hopefully usher in a deeper sense acceptance and therefore freedom. Carl Jung wrote the phrase “What you resist not only persists, but will grow in size”, when he found that the more patients resisted shadow aspects of themselves, the more those parts grew, eventually sometimes fracturing their psyches. Interestingly, some synonyms for the word “resistance” are fighting, opposition, battle, hiding, denying, blocking, combat, struggle. I think the reason so many of us feel that we’re in a state of struggle is that we spend so much of our time resisting reality, or the present moment. Even if we resist a past or future moment, memory or projection, we can still only resist it now. Resistance is like trying to hold a giant beach ball under the water. It takes a LOT of energy and eventually the thing is going to pop up onto the surface anyway. When we stop resisting whatever it is we don’t want or like, be it emotional discomfort, fear or aspects of ourselves that we dislike, we free up a huge amount of energy to do what we do want. The penny’s finally beginning to drop for me that the first step to loving ourselves completely and I believe finding peace, is accepting everything (the “good”, the “bad” and the “ugly” ) and resisting nothing. I’m realising that the more I resist or try to control anything, the more tired, frustrated, angry and resentful I become and the more of a struggle life is. When I resist something, I’m judging it, saying its not right and separating myself from it. At that point there is duality and struggle begins. However, when I make a conscious choice to stop, breathe and accept whatever it is, I feel peaceful… in that moment. The irony of life is that the one sure thing is that everything is going to change, yet we spend so much of our vital energy trying to ensure that it doesn’t. Dropping resistance is choosing acceptance and change. It doesn’t mean that we have to become whimps and relinquish our desires and dreams or stay in situations that we have the power to change. It simply means that if we accept the here and now, and stop being completely attached to controlling the outcome, we are able respond creatively and calmly to whatever unfolds.